مرادپور, زهرا, خدایی مطلق, مهدی, کاظمی بنچناری, مهدی, خلت آبادی فراهانی, امیرحسین. (1397). تأثیر پودرآویشن بر فراسنجه های ایمنی در بره های نر نژاد فراهانی. فصلنامه محیط زیست جانوری, 10(1), 53-58. زهرا مرادپور; مهدی خدایی مطلق; مهدی کاظمی بنچناری; امیرحسین خلت آبادی فراهانی. "تأثیر پودرآویشن بر فراسنجه های ایمنی در بره های نر نژاد فراهانی". 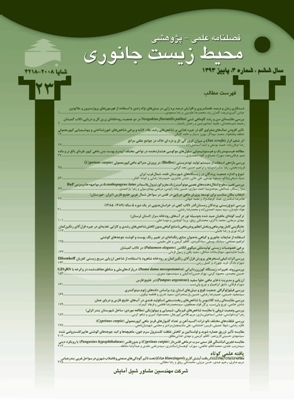 فصلنامه محیط زیست جانوری, 10, 1, 1397, 53-58. مرادپور, زهرا, خدایی مطلق, مهدی, کاظمی بنچناری, مهدی, خلت آبادی فراهانی, امیرحسین. (1397). 'تأثیر پودرآویشن بر فراسنجه های ایمنی در بره های نر نژاد فراهانی', فصلنامه محیط زیست جانوری, 10(1), pp. 53-58. مرادپور, زهرا, خدایی مطلق, مهدی, کاظمی بنچناری, مهدی, خلت آبادی فراهانی, امیرحسین. تأثیر پودرآویشن بر فراسنجه های ایمنی در بره های نر نژاد فراهانی. فصلنامه محیط زیست جانوری, 1397; 10(1): 53-58. به ­منظور بررسی تأثیر آویشن بر فراسنجه ­های ایمنی در بره­ های نر نژاد فراهانی از 20 رأس بره نر به ­صورت چهار تیمار پنج رأسی، در دو سن مختلف 5/5 ماهه و یک­ ساله استفاده شد. پژوهش حاضر در قالب طرح کاملاً تصادفی با آرایش فاکتوریل 2×2 به ­مدت 70 روز در ایستگاه تحقیقاتی گروه علوم دامی دانشگاه اراک انجام شد. تیمارهای آزمایشی عبارت بودند از: 1- جیره بره­ های 5/5 ماهه فاقد پودر آویشن، 2- جیره دارای 20 گرم پودر آویشن جهت تغذیه بره­ های 5/5 ماهه، 3- جیره بره­ های یک­ ساله فاقد پودر آویشن، 4- جیره دارای 20 گرم پودر آویشن جهت تغذیه بره­ های یک ­ساله. نتایج نشان داد که استفاده از گیاه داروئی آویشن تأثیر معنی ­داری بر فراسنجه ­های هماتولوژی و غلظت ایمنوگلوبولین­ ها (IgA، IgE و IgM) بره ­های نر نژاد فراهانی نداشت (0/05<P). نتیجه این تحقیق نشان داد که استفاده از پودر آویشن بر فراسنجه ­های خونی اثری نداشت. Ajayi, O.B. and Odutuga, A., 2004. Effect of low-zinc status and essential fatty acid deficiency of activities of aspartate amino transferase and alanin amino tranferazse in liver and serum of albino rats. Journal Nahrung. Vol. 48, No. 2, pp: 88-90. Ajibade T.O. ; Olayemi F.O. and Arowolo R.O.A., 2012. The haematological and biochemical effects of methanol extract of the seeds of Moringa oleifera in rats. JournalMedicine Plants Research. Vol. 6, No. 4, pp: 615-621. Al-Kassie, G.A.M., 2009. Influence of two plant extracts derived from thyme and cinnamon on broiler performance. Journal Pakistan Veterinary. Vol. 29, No. 4, pp: 169-173. Ather, M.A.M., 2000. Polyherbal additive proves effective against vertical transmission of IBD. World Poultry Science. Journal Elsevier. Vol. 16, pp: 50-52. Awaad, M.H.H. ; Sahar, A.; Zouelfakar, S.; Elshazly, O.A. ; Afify, M.A. and Shaheed, I.B., 2000b. Immuno modulatory properties of inactivated Propiobacterium granulosum (IM-104). 1: In non-immunosuppressed chickens. Egyptian Journal Veterinary Medicine Associated. Vol. 60, pp: 137-148. Billiard, M.; Blood, D.C. and Radostits, O.M., 1989. Veterinary medicine. 7th ed. London: Baillier and Tindal. pp: 228-298. Chehreie, A.; Noubakht, A. and Shahir, M.H., 2011. Effects of herbal supplement Byvhrbal (­contains essential oils of thyme and garlic­) on performance, egg quality, blood biochemical and immunity parameters of laying hens. Journal of Research and Construction. Ministry of Agriculture. Vol. 90, pp: 58-65. Chen, X.; Wu, Z. and Yin, J., 2003. Effects of four species of herbs on immune function of Carassius auratus gibelio. Journal of Fishery Sciences of China. Vol. 10, pp: 36-40. El-Ghousein, S.S. and Al-Beitawi, N.A., 2009. The Effect of Feeding of Crushed Thyme (Thymus Valgaris L) on Growth, Blood Constituents, Gastrointestinal Tract and Carcass Characteristics of Broiler Chickens. Journal of Poultry Science. Vol. 46, pp: 100-104. Garcia, V.P. ; Catala-Gregori, F.; Hernandez, M.; Megras, D. and Madrid, J., 2006. Effect of formic acid and plant extracts on growth, nutrient digestibility, intestine mucosa morphology, and meat yield of broilers. Journal of Applied Poultry Research. Vol. 16, pp: 555-562. Ghasemi, R.; Zarei, M. and Torki, M., 2010. Adding medicinal herbs including garlic (Allium sativum) and thyme (Thymus vulgaris) to diet of hens and evaluating productive performance and egg quality characteristics. Animal Veterinary Science. Vol. 5, No. 2, pp: 151-154. Greathead, H., 2003. Plants and plant extracts for improving animal productivity. proecedur. Nutr. Soc. Vol. 62, pp: 279-290. Grossi, A. and Lacetera, N., 2004. Administration of Thuya occidentalis in homeopathic dilution in goats vaccinated against bluetongue virus: a preliminary study. Journal of Animal and Feed Sciences. Vol. 13, pp: 593-596. Hernandez, F.; Madrid, J.; Garcia, V.; Orengo, J. and Megias, M.D., 2004. Influence of two plant extracts on broiler performance digestibilities and digestive organ size. Journal of Poultry Science. Vol. 83, pp: 169-174. Jatav, V.S. ; Singh, S.K. and Sharma, A.K., 2011. A Recent Phamacological trends of Glycryrrhiza glabra. International Journal of Phamaceutical frontier research. Vol. 1, No. 1, pp: 170-185. Jugl-Chizzola, M.; Ungerhofer, E.; Gabler, C.; Hagmuller, W.; Chizzola, R.; Zitterl-Eglseer, K. and Franz, C., 2006. Testing of the palatability of Thymus vulgaris L. and Origanum vulgare L. as flavouring feed additive for weaner pigs on the basis of a choice experiment. Berliner und Münchener tierärztliche Wochenschrift. Vol. 119, pp: 238-243. Langhout, P., 2000. New additives for broiler chickens. World Poultry Science. Journal Elsevier. Vol. 16, pp: 22-27. McGavin, M.D. ; William, W.C. and James, F., 2000. Zachary. Special veterinary pathology. first indian ed. delhi: published by s.k jain for cbs publishers and distrusters. pp: 229-268. Mirzaei, F.P. ; Dang, A.K. and Sehgal, J.P., 2011. Efficacy of polyherbal feed additives on nutrient digestibility, milk yield and composition of lactating crossbred goats. Indian Journal of Animal Sciences. Vol. 81, No. 8, pp: 886-890.
özer, H.; Sökme, M.; Güllüce, M.; Adigüzel, A.; Sahin, F.; Sökmen, A.; Kilic, H. and Baris, O., 2007. Chemical composition and antimicrobial and antioxidant activities of the essential oil and methanol extract of Hippomarathum microcarpum (Bieb.) from Turkey. Journal Agricultural and Food Chemistry. Vol. 55, pp: 937-942. Rivera, E. and Hu, S., 2003. Ginseng and aluminium hydroxide act synergistically as vaccine adjuvants. Vaccine. Vol. 21, pp: 1149-1157. Salamat, A., 2014. The effect Ziziphora tenuior of ration dry matter digestibility, microbial population in the rumen and blood parameters Dalaq sheep. Thesis MSC. Gorgan University of Agricultural Science and Natural Resources. (In Persian). Savoini, G. and Bontempo, V., 2002. Alternative antimicrobials in the nutrition of postweaning piglets. Veterinary Record. Vol. 151, No. 19, pp: 577-580. Seyedpiran, C.A. ; Noubakht, A. and Khodaie, S., 2011. The effects of probiotics, organic acid and mixed herbs on performance, egg quality and blood biochemical and immunity parameters of laying hens. Journal of Veterinary, Islamic Azad University of Tabriz. Vol. 17, pp: 1111-1122. Schranner, I.; Wurdinger, M.; Klumpp, N.; Lösch, U. and Okpanyi, S.N., 1989­. Beeinflussung der aviären humoralen immunreaktionen durch infuex und Echinacea angustifolia extract. Journal of Veterinary. Vol. 36, pp: 353-364. Steiner, T., 2006. Managing gut health. Natural Growth Promoters as a Key to Animal Performance. Nottingham University Press. 98 p.
Tollba, A.A.H. ; Shabaan, S.A.M. and Abdel-Mageed, M.A.A., 2010. Effect of using aromatic herbal extract and blended with organic acids on productive and physiological performance of poultry. 2- The growth during cold winter stress. Egyptian Poultry Science. Vol. 30, No. 1, pp: 229-248. Tucker, L., 2002. Botanical broilers: Plant extracts to maintain poultry performance. Feed international. Vol. 23, pp: 26-29. Vakili, A.R. ; Khorrami, B.; DaneshMesgaran, M. and Parand, E., 2013. The effects of thyme and cinnamon essential oils on performance, rumen fermentation and blood metabolites in holstein calves consuming high concentrate diet. Asian Australas Journal of Animal Science. Vol. 26, No. 7, pp: 935-944. Wei, A. and Shibamoto, T., 2007. Antioxidant activities and volatile constituents of various essential oils. Journal of Agricultural Food Chemistry. Vol. 55, pp: 1737-1742. Zi, X.; Mukhtar, H. and Agarwa, R., 1997. Novel cancer chemopreventive effects of a flavonoid antioxidant silymarin. Biochemical and Biophysical Research Communications. Vol. 239, pp: 334-339.